Our post on what makes a restaurant authentic posed a question: does the authenticity of food matter to you? The responses so far indicate that no, as long as the food tastes good. @marginfades And often, it's those cross-pollinated, inauthentic dishes that end up standing the test of time & becoming their own cuisine. Dishes like gumbo arose out of cultural fusions. at home, i combine irish cooking with indian cooking. i mix my sense of mexican with thai. all the time. too many fun and delicious results occur and we lose out when we don’t mix things. creole is a prime example of why mixing is fantastic. creating Creole is all about throwing away authenticity. italian food wouldn’t be italian food if they hadn’t tossed away authenticity when marco polo got back. All of this leads us to ask: does anyone take issue with the authenticity of the food they eat? If so, weigh in below. What Makes a Restaurant Authentic? Fusion food is fantastic; however, one should not claim to be something they aren’t. As I am on the constant search for good Creole food, which is often mislabeled as Cajun in this area. 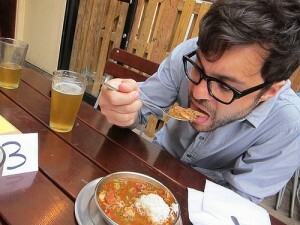 (Cajun food is from Western LA. The food they are often trying to duplicate, from Southeastern Louisiana, is primarily Creole.) In it’s inauthenticness, it is often not good, because I go in with certain expectations, only to be let down. because the chef is from Italy then you’re an idiot. Perhaps “authentic” food successfully captures the flavors and textures we grew up eating?